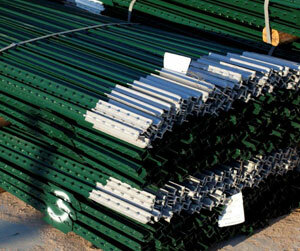 San Antonio Steel Company carries a variety of import and American-made studded t-posts. CMC Southern Post and W. Silver provide us with t-posts made from high-strength steel and coated with green or orange high-gloss, lead-free baked enamel paint.Painted T-posts are an economical alternative to galvanized T-posts in less-corrosive environments and are ideal for smooth or barbed wire fences. The t-posts range in weight from 1.01 to 1.50 pounds per foot and have distinctive white and silver reflective tips. These posts feature a 3-studded rivet anchor plate. Our posts are sold in bundles of 200 and come with Class 1 galvanized steel clips to swiftly attach fence wire to the metal posts. We recommend the use of galvanized t-posts and Class 3 clips for all Class 3, ZA and 50-Year Fence projects.